When it was announced that Colourpop was going to be carried at Sephora, I was personally really curious about how that was going to work. 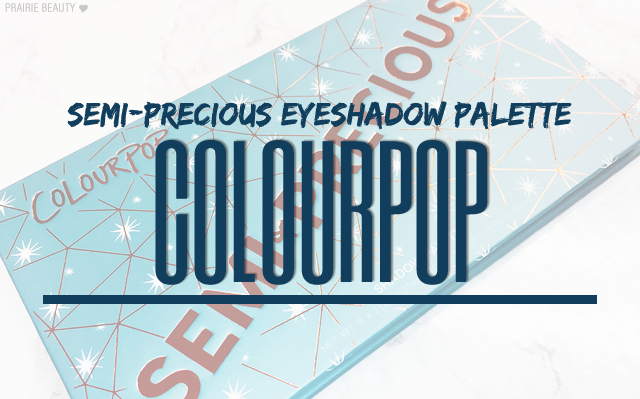 As a Canadian, it can be a bit of a pain to get Colourpop products since the exchange rate is pretty steep at the moment and oftentimes we have to pay duties once the products arrive. That being said, I'm actually a huge fan of the brand and I think their formulas are overwhelmingly impressive, particularly for the price point, so I was hopeful about the Sephora launch. 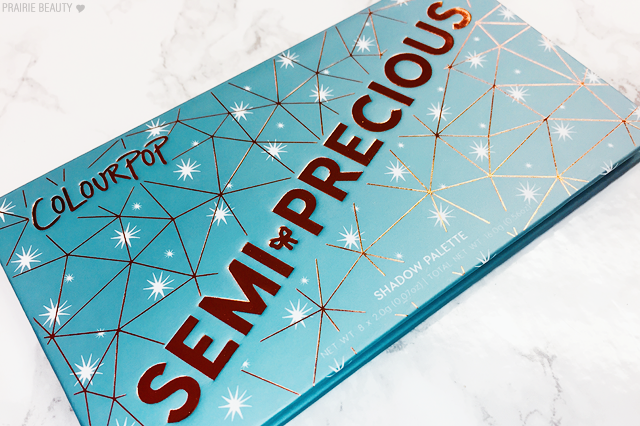 As we all know now, the launch has been pretty sparse, but they did release a couple of palettes that are exclusive to Sephora and as soon as I saw the Colourpop Semi-Precious Eyeshadow Palette, I absolutely had to have it so I ordered it on launch day at about 7am. For my thoughts on this palette - plus a bit of a rant about this launch - keep reading! As you can see, while there is a slight price difference between these, but they're all pretty damn close and there isn't a correlation between higher prices and availability at Sephora. Yes, you are paying more up front for the Sephora palettes, but you're also getting quite a bit more product. And these are still an incredible value, with shadows like ABH, Urban Decay, Too Faced and Tarte all being between 3 and 5 dollars US per gram. Our of curiosity, I checked out some drugstore palettes as well. Wet N Wild, essence, e.lf. and NYX all came in a little bit cheaper than the Colourpop palettes when compared per gram. L'Oreal was pretty close in price per gram. And the Maybelline was the most expensive per gram with the City Mini Palettes coming in $2.52/g, and the new Gigi Hadid City Mini Palettes at $3.77/g. If you'd be interested in a post breaking down the cost of popular palettes both high end and drugstore, let me know. I'm actually really interested in doing that! 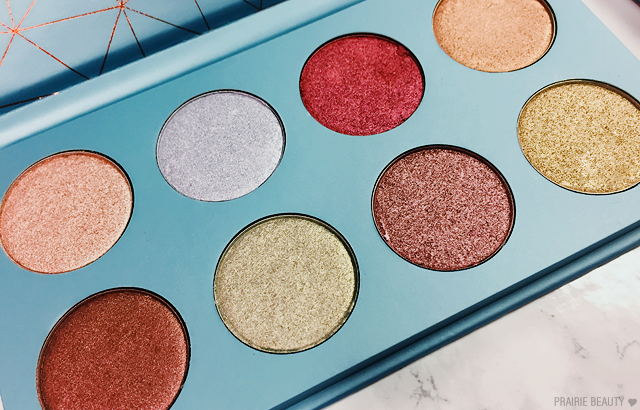 Now let's just go ahead and talk about this INSANELY gorgeous palette that it worth every single penny, shall we? 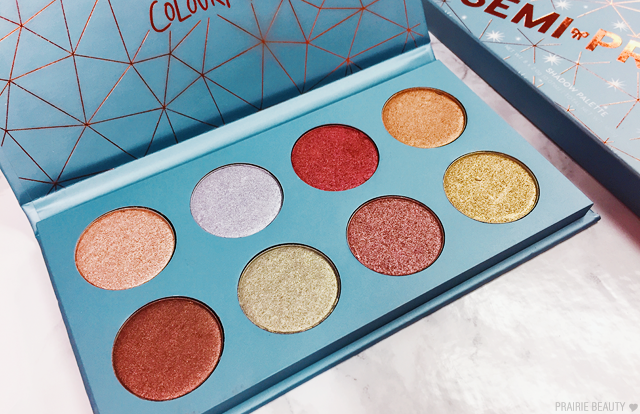 The Colourpop Semi-Precious Eyeshadow Palette contains 8 metallic shades in a theme based on "star stuff and celestial lights". 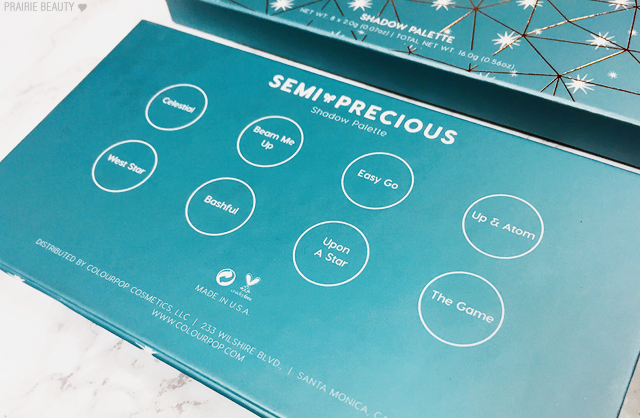 The packaging is absolutely adorable in a sturdy cardboard palette, no mirror, with the names of the shadows printed on the back. The packaging is blue with rose gold branding and design and overall I really think it's a pretty palette. And because I seriously don't care if a palette has a mirror, because I never use palette mirrors, that absolutely doesn't bother me but it is something to note. When it comes to the curation of this palette, I am absolutely in love. I think these are all really beautiful lid shades for different types of looks and they're all different enough that I don't feel like anything is wasted. You know those palettes where you have three or four light shimmery shades in different undertones that all look basically the same on the lid? This is absolutely not like that. These shades are all very different and show up true on the lid. I want to talk about each shade separately, because I do think there are some slight variances in formula. This will likely be my most used shade in this palette because it's so insanely universal. It also packs a ton of glow and shows up really bright and glowy on the lid. Great formula, super pigmented and creamy. This actually feels like a really unique shade to me. It's bright and silver, but there's a really pretty blue/lavender undertone that makes it a little more interesting for me. Like Celestial, this has a really gorgeous, creamy formula with a ton of shine. This is one of two shades that behaves a little differently than the rest. While this is a super pigmented, amazingly bold red shade, it's a little less shiny than most of the other shades. For me, personally, I actually like that because I feel like too much shine would take away from the boldness. This is going to be another shade that I know I'll constantly reach for. It has that bronzey tone to it, not too much copper, and even though it's deeper than Celestial it also brings a ton of shine and brightness to the lid. Again, gorgeous formula that's super pigmented and creamy. This is the second shade in the palette that's a little less shiny like Easy Go and very much like that shade, this packs a lot of pigment a really bold shade that still has glow but isn't quite as blinding. Also, I'm obsessed with it. So pretty. I actually used this as my lid shade in one of my first looks with this palette and it's super pretty. Though it is definitely green and maintains that on the lid, it almost behaves like a neutral because it's such a soft colour but doesn't skew too pastel. Gorgeous formula, like the others. This is another shade that is likely to be an obsession for me. It's a pink berry shade that has a little hit of depth to it but also a lot of gorgeous shine. I love this type of shade for mauve toned eye looks as a pop on the lid, and I absolutely loved the look I created with this shadow. Formula is, again, absolutely on point. I love that they included this more olive toned gold in this palette. I kind of hate wearing yellow gold myself, because it looks weird on my skin tone, but this kind of old gold shade is perfect. It's also, again, super bright and blingy with a great formula. I realize that I kind of beat it death when talking about each shade, but I really love the formula of these. Easy Go and West Star do feel a little bit stiffer and show up with less shine on the lid, but they're still both a gorgeous, smooth texture with a lot of pigment to give a really bold look on the lid. 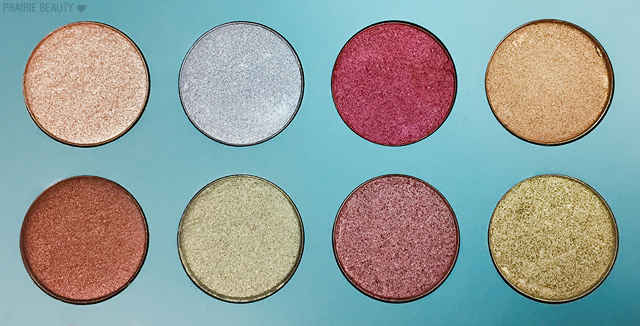 Because they aren't as shiny and have that depth, they're also really perfect to pair with other shades in the palette. The rest of the shades are quite soft in the pan with a really creamy texture and they also apply with high pigment and bold colour on the lid. I was a little bit afraid that these wouldn't pick up and pack on with a brush, but I needn't have worried. Using a flat packing brush, these pick up really easily and I find I don't have to work at all to get them to transfer and show up really beautifully on the lid. Wear time has been really good on these and I haven't had any issue with creasing, though I have always worn these with eyeshadow primer so I can't say how they hold up on bare lids. Overall, I think this is a really beautiful palette. Obviously, because it doesn't contain any mattes, this isn't going to be an all-in-one eyeshadow palette, but I think it's a phenomenal companion palette to be paired with all matte palettes or matte singles. 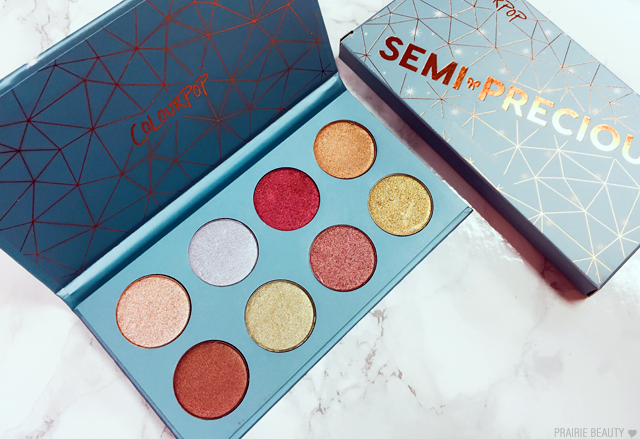 The Colourpop pressed eyeshadow formula is incredibly impressive to me and after picking this up I actually have every intention of ordering some of the smaller palettes that Colourpop sells on their website - and hoping that Sephora will soon expand on what they offer to include a wider range of products from the brand. If you're thinking about picking up the Colourpop Semi-Precious Eyeshadow Palette, I honestly highly recommend it. Here in Canada, it retails for $33, which is about 30% higher than the US price and is about standard as far as the price difference between US and Canada on Sephora.